Announcing general availability of Azure IoT Hub’s integration with Azure Event Grid - IoT Hub integration with Azure Event Grid is now generally available, making it even easier to transform business insights from billions of devices sending their data to the cloud into actions by simplifying the architecture of IoT solutions. Now you can easily integrate with modern serverless architectures, such as Azure Functions and Azure Logic Apps, to automate workflows and downstream processes; enable alerting with quick reaction to creation, deletion, connection, and disconnection of devices; and eliminate the complexity and expense of polling services and integrate events with 3rd party applications using webhooks such as ticketing, billing system, and database updates. The IoT Show | Azure IoT Hub and Azure Event Grid - The Azure IoT Hub and Event Grid integration is now generally available and comes with support for new types of events coming out of IoT Hub. You can now easily integrate your IoT workflows with other Azure services using the Azure pub-sub platform as demonstrated by Ashita Rastogi, PM in the Azure IoT team. Microsoft Azure, the cloud for high performance computing - Azure CycleCloud, a tool for creating, managing, operating, and optimizing HPC clusters of any scale in Azure, is now generally available. Now it's easier for everyone to deploy, use, and optimize HPC burst, hybrid, or cloud-only clusters. Microsoft Azure provides a variety of virtual machines enabled with NVIDIA GPUs, which provide outstanding performance for AI and HPC. Azure users and cloud developers now have a way to accelerate their AI and HPC workflows with powerful GPU-optimized software that takes full advantage of supported NVIDIA GPUs on Azure. Azure CycleCloud and NVIDIA GPUs ease integration and the ability to manage and scale. Azure Friday | Azure Automation - Jenny Hunter joins Scott Hanselman to discuss Azure Automation, which has seen several new improvements including support for Python 2, the ability to run against local Linux machines, the ability to run against any Azure VM with no setup (Run Command), and native Azure alert integration. Helping Go developers build better cloud apps faster - Last week, GopherCon took place in Denver. Since making the Azure SDK for Go generally available earlier this year, our teams have been hard at work building Go tools and services for Azure, Visual Studio Code, and Visual Studio Team Services. We continue to strive to help Go developers build better cloud apps, faster, with an expanding range of services covering the cloud-native workflow. We recorded a series of Azure Friday episodes that demonstrate how to build and run Go apps with Azure, Visual Studio Code, and Visual Studio Team Services. Check out the series at Go on Azure. Announcing Project Athens and GopherSource for the Go community - In February, engineers from Microsoft and other collaborators began working on Project Athens, an open source project released under the MIT license and hosted on GitHub, to create the first proxy server for Go modules. Along with the Athens community, we are currently focusing on improving the modules experience, ensuring that Go modules work seamlessly with all proxy servers, and working to set up a federated, organizationally diverse proxy network. GopherSource is an initiative to strengthen and diversify the Go ecosystem through building up more contributors to upstream Go and key Go projects, such as Project Athens, from within the community. By encouraging the Go community’s own talented developers to contribute to upstream Go, we ensure that the Go ecosystem will meet the needs of the entire community. A quick take on the State of Hybrid Cloud survey - Microsoft conducted a survey with research firm Kantar TNS in January 2018, asking more than 1700 respondents to chime in. Surveys were collected from IT professionals, developers, and business decision makers to identify how they perceive hybrid cloud, what motivates adoption, and what features they see as most important. Check out this post for a summary infographic of the survey results, and watch the on-demand webinar for a more complete review. 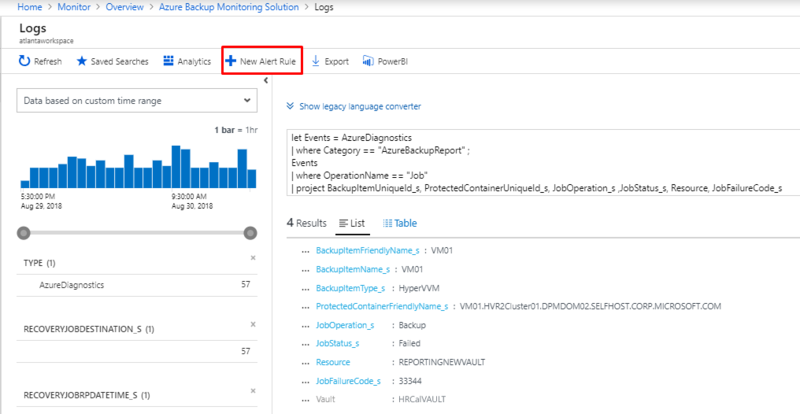 Monitor all Azure Backup protected workloads using Log Analytics - Azure Backup now allows you to monitor all workloads protected by it by leveraging the power of Log Analytics, which enables you to monitor key backup parameters across Recovery Services vaults and subscriptions irrespective of which Azure backup solution you are using. This solution now covers all workloads protected by Azure Backup including Azure VMs, SQL in Azure VM backups, System Center Data Protection Manager connected to Azure (DPM-A), Microsoft Azure Backup Server (MABS), and file-folder backup from Azure backup agent. Protecting privacy in Microsoft Azure: GDPR, Azure Policy Updates - Microsoft designed Azure with industry-leading security controls, compliance tools, and privacy policies to safeguard your data in the cloud, including the categories of personal data identified by the GDPR. These also help you comply with other important global and regional privacy standards such as ISO/IEC 27018, EU-U.S. Privacy Shield, EU Model Clauses, HIPAA/HITECH, and HITRUST. Check out the video in this post to learn how you can accelerate your move to the cloud by achieving compliance more readily, allowing you to enable privacy-sensitive cloud scenarios, such as financial and health service, with confidence. 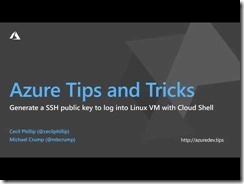 How to generate SSH public key to log into Linux VM | Azure Tips and Tricks - Learn how to generate SSH public keys to log into a Linux VM with Cloud Shell and BASH on Windows 10. Watch how you can automatically log into a VM without having to put in a password if you SSH into the server. 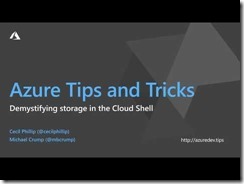 How the Azure Cloud Shell uses storage | Azure Tips and Tricks - We'll demystify storage in the Azure Cloud Shell. When creating an Azure storage account, it will use the storage account to persist any of the information you might need whenever you're interacting with your resources. Turn your whiteboard sketches to working code in seconds with Sketch2Code - As covered in an earlier episode of The AI Show, Sketch2Code is a web-based solution that uses AI to transform a handwritten user interface design from a picture to a valid HTML markup code. Check out this post to understand the process of transforming handwritten image to HTML using Sketch2Code in more detail. You can find the code, solution development process, and all other details on GitHub. Sketch2Code is developed in collaboration with Kabel and Spike Techniques. 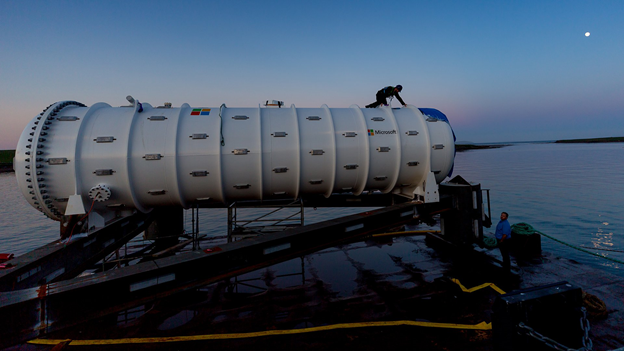 Monitoring environmental conditions near underwater datacenters using Deep Learning - Project Natick seeks to understand the benefits and difficulties in deploying subsea datacenters worldwide; it is the world's first deployed underwater datacenter and it was designed with an emphasis on sustainability. Phase 2 extends the research accomplished in Phase 1 by deploying a full-scale datacenter module in the North Sea, powered by renewable energy. Project Natick uses AI to monitor the servers and other equipment for signs of failure and to identify any correlations between the environment and server longevity. Sharing a self-hosted Integration Runtime infrastructure with multiple Data Factories - The Integration Runtime is the compute infrastructure used by Azure Data Factory to provide data integration capabilities across different network environments. If you need to perform data integration and orchestration securely in a private network environment, which does not have a direct line-of-sight from the public cloud environment, you can install a self-hosted Integration Runtime on premises behind your corporate firewall, or inside a virtual private network. Thanks to self-hosted Integration Runtime sharing, you can share the same self-hosted Integration Runtime infrastructure across data factories, which enables you to reuse the same highly available and scalable self-hosted Integration Runtime infrastructure from different data factories within the same Azure Active Directory tenant. Azure Content Spotlight – Migrate Apps to Azure - This week's spotlight shines light on a set of resources that can help software architects and developers gaining insights about the different services and resources Azure has to offer to migrate their applications to the cloud, including patterns and best practices. The Azure Podcast: Episode 244 - Azure Container Instances - Justin Luk, a PM on the Azure Compute team, breaks down ACI for us, giving advice on why and when you should consider this new service for your container workloads. Accelerating Artificial Intelligence (AI) in healthcare using Microsoft Azure blueprints - To rapidly acquire new capabilities (like AI) and implement new solutions, healthcare IT and developers can now take advantage of industry-specific Azure Blueprints. Blueprints include resources such as example code, test data, security, and compliance support. Using these blueprints, your healthcare IT team can quickly implement a new type of solution in your secure Azure cloud. With a blueprint, however, you get 50 percent to 90 percent of the end solution. Then, you can simply devote your efforts and resources to customizing the blueprint solution. You can learn more by watching the Accelerating Artificial Intelligence (AI) in Healthcare Using Microsoft Azure Blueprints Webcast with David Starr, Principal Systems Architect, Azure. Microsoft Azure Data welcomes attendees to VLDB 2018 - While gophers were in Denver for GopherCon, the data crowd ventured to Rio de Janeiro for the 44th International Conference on Very Large Data Bases (VLDB) 2018. VLDB is a premier annual international forum for data management and database researchers, vendors, practitioners, application developers, and users. Rohan Kumar Corporate Vice President, Azure Data took this opportunity to catalog the many services and ongoing work in the Azure Data group at Microsoft. As Kumar states, "The emergence of the cloud and edge as the new frontiers for computing, and thus data management, is an exciting direction—data is now dispersed within and beyond the enterprise, on-premises, on-cloud, and on edge devices, and we must enable intelligent analysis, transactions, and responsible governance for all data everywhere, from the moment it is created to the moment it is deleted, through the entire life-cycle of ingestion, updates, exploration, data prep, analysis, serving, and archival." Azure Site Recovery between Regions - Corey Sanders, Corporate VP - Microsoft Azure Compute team sat down with Sujay Talasila, Senior PM Manager on the Azure Compute Team to talk about new changes to Azure Site Recovery. Azure Marketplace new offers: July 16-31 - The Azure Marketplace is the premier destination for all your software needs – certified and optimized to run on Azure. Find, try, purchase, and provision applications & services from hundreds of leading software providers. In the second half of July we published 50 new offers, including: Akamai Enterprise Application Access, Fedora Linux, Carbonite's Migrate to Azure Stack - Windows 1Tb (4-Wks), and more. Securing Kubernetes workloads in hybrid settings with Aporeto - Aporeto, a Zero Trust security solution for microservices, containers and cloud, provides centralized visibility and security for applications distributed on Azure Kubernetes Service (AKS) and private clouds. Fundamental to Aporeto’s approach is the principle that everything in an application is accessible to everyone and could be compromised at any time. Because Aporeto untethers application security from the network and infrastructure, one key benefit of Aporeto’s approach for protecting your containers, microservices and cloud applications is that you can have a consistent security approach even in a hybrid or multi-cloud setting. Keeping shelves stocked and consumers happy (and shopping!) - Mariya Zorotovich Worldwide Retail and CG Industry Leader covers how advanced analytics can help retailers solve out-of-stock challenges and gain an estimated 5-10 percent increase in sales. To determine how to solve out-of-stocks with a SKU assortment optimization solution, read the Inventory optimization through SKU Assortment + machine learning use case. This document provides options for solving the out-of-stock challenge and a solution overview leveraging Azure Services, including an approach by Neal Analytics, Microsoft 2017 Global Partner of the Year for business analytics. Extracting actionable insights from IoT data to drive more efficient manufacturing - Thanks to the explosion of IoT we now have millions of devices, machines, products, and assets connected and streaming terabytes of data. But connecting to devices, ingesting and storing their sensor data is just the first step. The whole point of collecting this data is to extract actionable insights — insights that will trigger some sort of action that will result in business value. To take the first actionable step in using an IoT solution, we just released the Extracting insights from IoT data overview. Here you can learn more about the value of IoT data, the anatomy of an IoT solution, available options for IoT data analytics, how to act on the insights you extract, and build vs. buy considerations. Four trends powering healthcare AI, and what you can do about it - A tsunami of healthcare data, healthcare professional burnout, healthcare costs are redlining, and ransomware disrupts healthcared and breaches erode patient trust. Download the new, free AI in Healthcare guide a to find out more about how these trends are driving a new set of transformational use cases and workloads powered by AI and delivered from the Microsoft Azure cloud. Don't start from scratch. See how you can accelerate your healthcare AI initiative with free blueprints that include not only documentation and security and compliance support, but also example code, test data, and automated deployment to rapidly establish an AI solution reference starting point that you can then customize to achieve your target AI solution faster. Key partners are also available to help you further accelerate your AI initiatives. Two seconds to take a bite out of mobile bank fraud with Artificial Intelligence - As mobile banking grows, so does the one aspect about it that can be wrenching for customers and banks, mobile device fraud. Artificial Intelligence (AI) models have the potential to dramatically improve fraud detection rates and detection times. One approach is described in the Mobile bank fraud solution guide. It’s a behavioral-based AI approach and can be much more responsive to changing fraud patterns than rules-based or other approaches. The guide explains the logic and concepts and gets you to the next stage in implementing a mobile bank fraud detection solution. 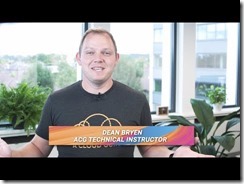 Azure This Week - 31 August 2018 - This Week: Dean Bryen takes a look at the introduction of Google Identities in Azure AD B2B, how you can turn your whiteboard wireframes into HTML with the sketch2code tool, and the public preview of confidence scores for alerts in Azure Security Center.